These critter hand pipes are stand out. Each one has a 3 eyed lizard wrapped around them. .. These Frit hand pipes from Revlock Glass are beautiful! 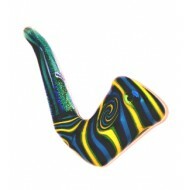 They look like swirled paint brought t..
Frit Hand Pipes by Revlock Glass. Solid frit hand pipes by Revlock Glass. Thick with left sided carbs. 4 colors to choose ..
Frit Hand Pipes by Revlock Glass. Solid Frit Colors. Fumed hand pipes by Multiverse Glass. 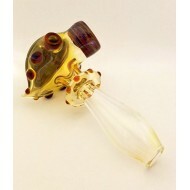 Fumed swirls throughout the pipes encased in thick glass..
Fumed Hand Pipes by Multiverse Glass. Beautiful hand pipe by Dan Knowles. Looks like bright waves of a galaxy meeting a black hole.&..
Hand Pipe by Dan Knowles. Spectacular spoon by Dan P. Beautifully fumed. Aztec Sun design on head. Docs Smoke.. 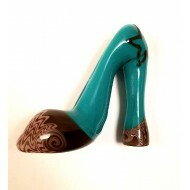 This is a vintage High Heel by Dellene Peralta. 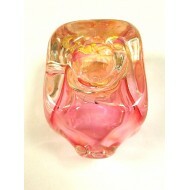 One of the only female glass artists in "Degenerate ..
Red dragon hand pipe by Empire Glassworks. 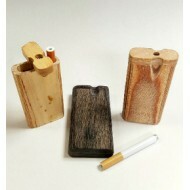 Empir∃ Glassworks was established in 2013 to promote a.. Empire Glassworks Spoon. Toad embellishment. Empir∃ Glassworks was established in 2013 to p..